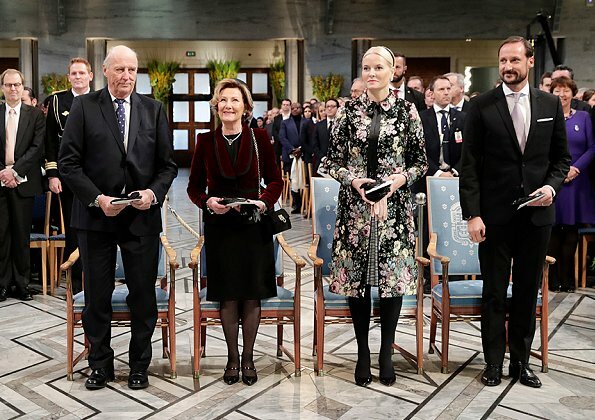 On December 10, 2017, King Harald V of Norway, Queen Sonja, Crown Prince Haakon and Crown Princess Mette-Marit attended 2017 Nobel Peace Prize ceremony held at Oslo City Hall. 2017 Nobel Peace Prize was given to ICAN which conducted an international campaign for the purpose of abolishing nuclear weapons. 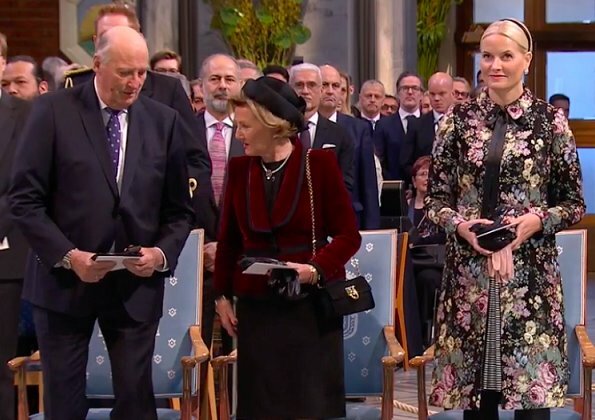 A monetary award of about 1 million Euro will be given to ICAN which won 2017 Nobel Peace Prize. 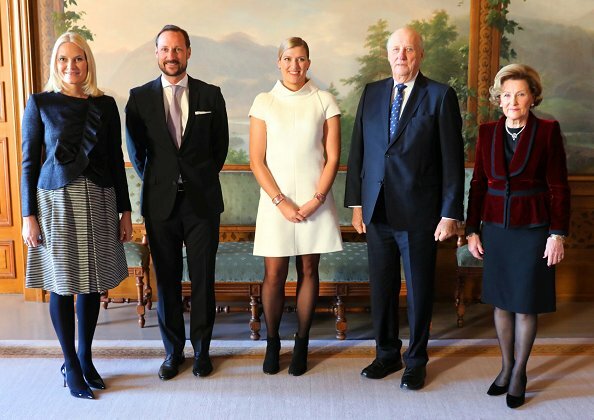 King Harald of Norway along with Crown Princess Mette-Marit, Crown Prince Haakon and Queen Sonja met with the Nobel Peace Prize laureate, Executive Director of ICAN (International Campaign to Abolish Nuclear Weapons), Beatrice Fihn at the Royal Palace in Oslo. 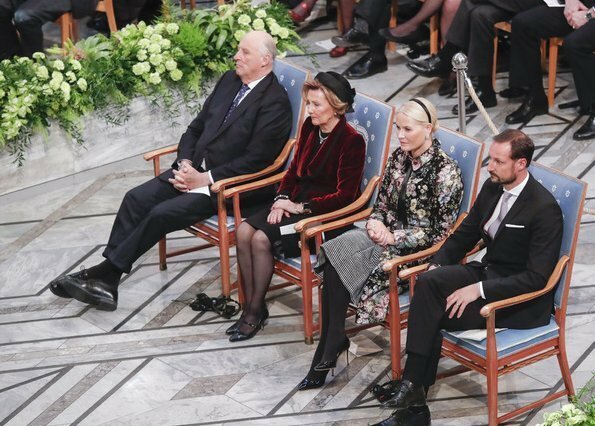 Queen Sonja looks good and appropriate! 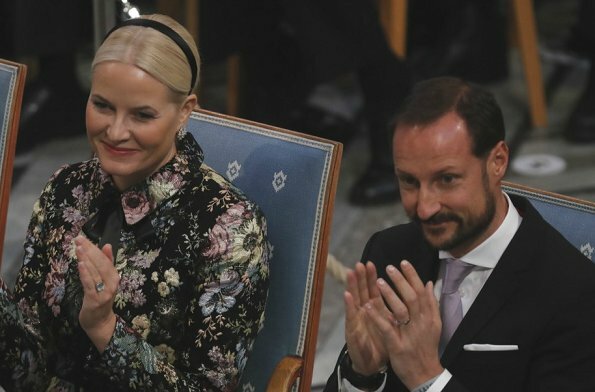 Agree that Sonja looks lovely. Jacket is a beautiful fabric. Necklace is exquisite. M -M looks surprising good. I think she is a good-looking woman, but as to her dress sense...I have my doubts. This is the one time of the year when MM excels (well in the first two photos anyway). The rest of the year can be pretty hit and miss, with a good chance of more misses than hits, but normally MM pulls out a winner for the awards, and I think she has done so again. It's not a blouse is a Valentino jacket over a Prada dress. Both are old pieces and used many times before.